Easy Apple Crisp (7-minute prep time) - I Can Teach My Child! There’s nothing that says “fall” like warm apple crisp…except for potato soup, maybe. I LOVE apple crisp and always look forward to making it in the fall. The apples are yummy, but I especially love the “crisp” part of this dessert…the topping! So I tweaked a recipe I found in a local high school cookbook to add a little bit more topping (if you’re not a topping lover like me…just make the oats, flour, brown sugar, and butter each 1 cup). And the best part is…this dessert can be thrown together with only 7-minutes of prep time! Believe me, I timed myself…I’m a dork, apparently. 1. Grease your pan (I used 8×8) and then dump both cans of apples in. 2. 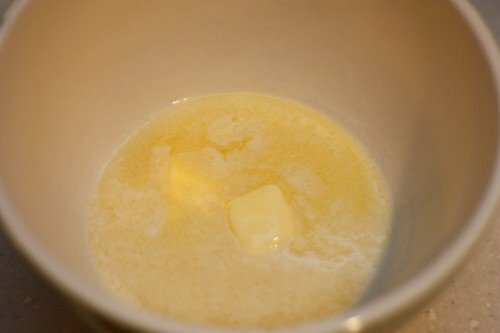 Melt 3/4 cup of butter (1 1/2 sticks). 3. Mix together the remaining ingredients. 4. Spread the mixture on top of the apples. The reason mine looks “dry” in some areas is because I tried to get away with only using 1 stick of butter. It didn’t work and I had to melt another 1/2 stick and sprinkle it on the top. I would suggest just mixing it all together in step 3. Serve with vanilla ice cream, if you wish…or just eat it on its own! Delicious and easy! This was first published October 2011. Updated 2018. 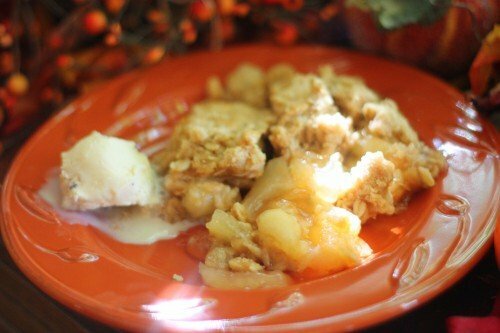 Our family still love this apple crisp recipe! My oh my this was delish!! Just made it for Bible Study tonight and the ladies raved:) Thanks for sharing!! Yes i agree this was super easy in a time crunch and very yummy. I did tweak just a bit 2nd time around. I used bisquick instead of flour, baking soda and baking powder. Lowered bisquick to 1 cup vs. 1 1/2 cups, lowered brown sugar to 1 cup vs 1 1/2 cups and lowered melted butter to 1/2 cup. First time it almost baked over my 8×8 dish, but 2nd time was perfect. If u want to make the original i just suggest using a slightly bigger pan. Thanks for great recipe! Made this last night. Husband raved. At first he was horrified I was using canned pie filling but hey, did he want dessert or not? I used the modified version of cutting down on the streusel topping and also mixed the melted butter in with the dry ingredients, spooning it over the apples. Have already sent this recipe on to friends. Thanks! I’m in an all chick rock band and needed something warm and tasty to share with the girls after practice. Temps have dropped 40 degrees over night so it’s safe to say we were cold! Thanks! That was a real hit. I followed it as written. It’s perfect. Made this recipe with 2 cans of “Fried Apples” 20 oz. each and used an 8 x 12 glass pan. Was GREAT until my 1 cup, glass, PYREX measuring cup busted in microwave while measuring hardened brown sugar! I made this tonight & discovered there was no flour in my mother’s kitchen. So I used corn flakes-not sweetened-instead of flour. To my surprise, it was excellent. I made it like you said & the topping was dry. I used 1 1/2 sticks of butter & mixed it in with the dry ingredients just the very top was dry like there was not enough butter. We have not eaten it yet. Looks like it Ali be yummy. Perfect for my potluck at work!!! Do you have the nutirion info?? I made this the other day and it was delicious! I changed it just a little by using more butter, adding a little nutmeg and mixing the butter and ingredients together before spooning onto the apples. My hubby loved it! I’m making it again tonight. Thanks for the great recipe! I doubled the recipe and used a 9×13 pan…perfect! Left out the salt and it tasted great!!!!!!! Thank you!!!!!!!!!!!!!!! Easy and tasty, bookmark this for when you need something to pull together fast. Just a suggestion. and THANKS for the great recipe! It’s baking now and smells heavenly!